Equipment: TV/VCR, microwave / Convection oven, stove top, pull out sofa	Back Up camera, auto roof vents, auto leveling system	Weather Pro power awning, exterior stereo	Reese hitch, roof ladder, power steps, AC / Heat	Solar battery charging system. DISCLAIMER: National, its agents and brokers, offer the details and descriptions of the motor homes in good faith but do not guarantee, warrant or represent the accuracy of the information or guarantee, warrant or represent the description or condition of the motor homes. A buyer should verify the description and condition of any motor home through an inspection by a qualified surveyor and/or mechanic. 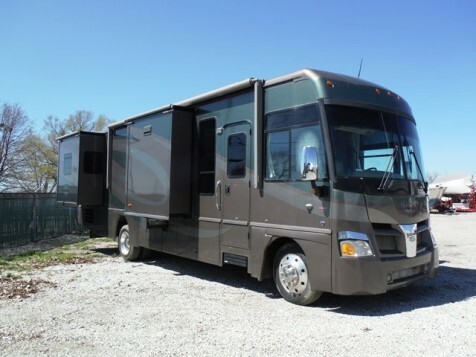 The motor homes are offered subject to prior sale, price change or withdrawal without notice. THIS IS NOT AN OFFER FOR THE SALE OF THE MOTOR HOMES BUT AN INVITATION TO MAKE AN OFFER TO BUY SUBJECT TO ALL OF NATIONAL'S TERMS AND CONDITIONS. National makes no guarantees, representations or warranties as to title and the ability to document or register the motor home. National is acting as a broker only and all issues as to title, documentation and registration are between the buyer and seller. This RV has been sold. It is no longer available.